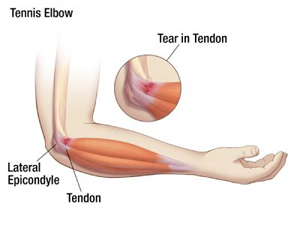 Lateral epicondylitis, commonly known as Tennis Elbow is caused by overuse, or overload, of the muscles of the forearm. It is caused by excessive strain on the extensor muscles of the forearm resulting from wrist extension, such as in “back hand” tennis players, or occupations that involve repetitive wrist movement, such as carpenters or bricklayers. It may be provoked by any exercise that involves repeated and forcible extension movements of the wrist, like using a screwdriver or hammer. Osteopathic treatment is aimed at restoring normal, painless movement of the elbow and wrist. In the acute phase, ice therapy can be useful to help reduce inflammation in the muscle tissue. Rest is also recommended, particularly from the offending activities. Osteopathic treatment can assist with stretching the muscles involved and reducing the inflammation in the elbow. Your Osteopath will also check any other areas that may be affected, such as the shoulder or upper back and neck, and show you stretches you can do to reduce tension in the forearm muscles and later on, exercises you can do to strengthen these muscles.